Dylan’s Oyster Cellar raises the oyster and fried fish ball game. The first thing to know about Dylan’s Oyster Cellar is that it’s not in a cellar. Dylan Salmon’s place is above ground in Baltimore at the east end of The Avenue in the city’s Hampden neighborhood. Opened in December 2016, Salmon renovated a former corner florist’s shop with his wife, Irene, whom he first met 10 years ago on a summer boat-day on the Chesapeake. “Oysters are a simple, pure food, that are such a good expression of their place,” he says. Salmon loves sharing local and industry knowledge, like how the White Stone Oyster Company in Virginia farms their varieties just north of the Rappahannock in floating cages on top of the water. They’re one of the few using the Australia-born technique on the Chesapeake Bay, which gives their oysters a meatier and smooth, golf-ball sized shape. And he describes the phenomenal, long, skinny Shooting Point Salts that Tom Gallivan grows with his own seed in Chincoteague. “Sorry if I’m boring you,” Salmon says amid the explanation (and, no, he’s not), essentially admitting his mollusk nerdiness, which also comes out when he speaks about adding new oysters to the menu as if he’s on a treasure hunt. “Chilean flats, they’re my new obsession,” Salmon says, speaking about a variety that grows in a pancake shape as opposed to the teardrop we know. Mark Kurlansky’s landmark book, The Big Oyster, about the history of New York told through the half shell, was his inspiration, and the descriptions of sometimes dark and dank, yet other times elegant, 1800s oyster cellars are seared in his mind. “I fell in love with the romance of that idea, of a simple spot doing oysters and booze,” the 34-year-old Baltimore native says. With a 75-person capacity, Dylan’s features a J-shaped raw bar with bistro stools, cozy booths, and tables in an open-concept room. The ornate, white, mosaic-tiled floor pops, and an approachable atmosphere befits its unpretentious attitude and staple food. The oyster offerings typically include six to 12 different kinds, a mixture of sizes and buttery-ness, saltiness and sweetness, with half coming from the Virginica species found in the Chesapeake, seaside Virginia and seaside Maryland. Most are hand-delivered in boxes or bags from farmers and put on ice no more than 10 days since harvesting. “We want to keep really fresh product in house,” Irene Salmon says. A cool dozen, freshly shucked. 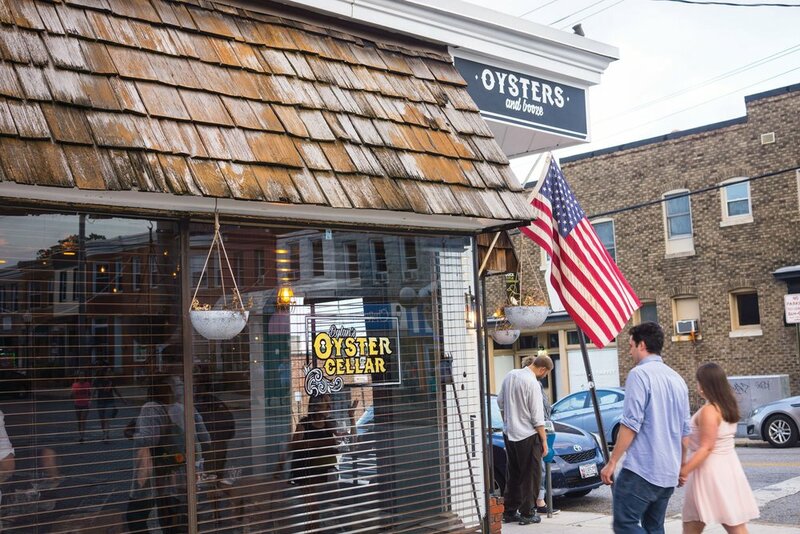 Salmon opened the original Dylan’s Oyster Cellar in a subterranean 21-seat pop-up space in Baltimore’s Mount Vernon neighborhood in 2014. The concept—oysters, beer, wine and liquor, and open late—caught on quickly, but the contract and residency lasted only six months. At the time, Salmon searched for a permanent underground space in Baltimore, given its “cellar” name, but eventually decided on the current, highly visible, above-ground corner near Roland Park where he grew up and attended the Gilman School. A new, expanded menu grew to include things like a soft-shell crab sandwich, clams, salads, burgers, fish, and an old-time regional snack, the coddie, a Baltimorean, blue-collar alternative to the crab cake. For four bucks, you can enjoy the deep-fried salt-cod and potato ball served with a set of saltine crackers and yellow mustard. On one Saturday evening, our foursome arrived and sat at table near the entrance as jazz coursed through the sound system and a golf tournament played out on the bar TV. On another summer Friday night, the place was packed, and three of us sat at one of the handful of tables outside on the sidewalk. I sipped down two ice-cold Skinny Dipper oysters from St. Mary’s County and a pair of Shiny-Sea’s from Canada’s Prince Edward Island with a rum cocktail, and I was content even before a spectacular fried oyster sandwich arrived. Corey McLaughlin is a writer and editor based in Baltimore. He can be reached at corey.mclaughlin@gmail.com.